Olivia On Warren is very proud to present photographs by Brian Branigan, Friday November 28, 2008 through December 30, 2008. Also showing, pen and ink Jazz drawings with water color was by Leo Meiersdorff; Paintings by Victor Matthews; and Hand Crafted Jewelry by Ruth Beattie, a.k.a. Allison Culbertson. Olivia On Warren Open Thursday - Sunday 12-6 and by special appointment, closed Monday - Wednesday. Olivia On Warren is very proud to present photographs by Brian Branigan, Saturday November 1, 2008 through December 6, 2008. Also showing, Allison Culbertson hand crafted jewelry "Inspired By Nature" and Victor Matthews Antarctica paintings and drawings. Olivia On Warren, the newest gallery addition at 435 Warren street in Hudson, NY is very proud to present "Day One", Saturday July 26, 2008 5PM to 8PM. 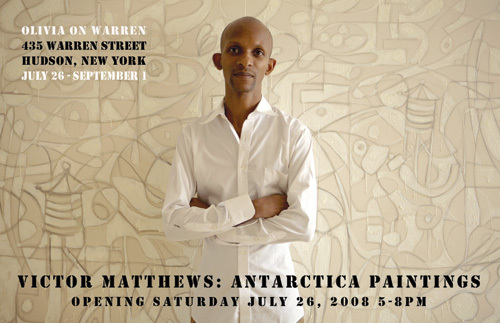 This premier opening will feature Victor Matthews: Antarctica paintings, oil, encaustic and graphite on canvas. International artist Victor Matthews was born in Brooklyn in 1963 and currently lives in New York City. He attended the High School of Art and Design and received his BFA from the Art Institute of Fort Lauderdale. His work has been exhibited in numerous solo exhibitions in the US and abroad, including the 48th Venice Biennale, Museum Sala Uno (Rome), Stephen Wirtz Gallery (San Francisco), Perry Rubenstein Gallery (New York), and The Sculpture Center (New York). His work is in the permanent collection of the Museum Overholland (Amsterdam), Cornell University (Ithaca NY), Museum Ludwig (Cologne), New School (New York), and Museum Nuova Icona (Venice), as well as in the private collections of Russell Simmons, Brice & Helen Marden, Francesco & Alba Celmente, Vera List, Nathaniel Rothchild, President Mogae of Botswana, Ronald Perelman, and Forest Whitaker, among others. Also showing, Allison Culbertson hand crafted jewelry "Inspired By Nature" and Brian Branigan silver gelatin prints, "Beauty In The Otherwise Ordinary". Olivia On Warren Open Monday - Sunday 12-6 and by special appointment, closed Wednesday.